How to host Friendsgiving with tips, tricks and hacks from Curtis Stone, Wolfgang Puck and more. While hosting friends on Thanksgiving may seem less stressful than hosting family, the list of potential hiccups is just as long. Even the experts fail sometimes. For example, even Martha Stewart burned her first turkey. 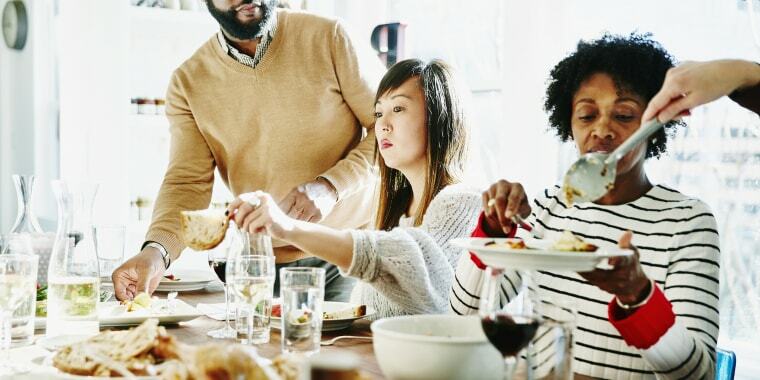 With a little planning and a few tips, tricks and hacks from veteran hosts like celebrity chefs Curtis Stone and Wolfgang Puck, hosting a Friendsgiving feast can be a breeze. 1. Consider telling guests that they shouldn't bring anything. “When I do Friendsgiving, I do not ask my friends to bring anything,” celebrity chef and restaurateur Wolfgang Puck told TODAY Food. Puck told TODAY Food that he once accidentally “turned a turkey the color of charcoal.” He ended up serving it skinless. Still, he doesn’t even let guests bring wine. There are a few advantages to providing every dish and drink. There’s no surprise casserole to try to find room for in the oven. Plus, there's no need to answer a ton of questions beforehand about what kind of wine to bring. Instead, guests can bring canned food or a clothing donation for charity. 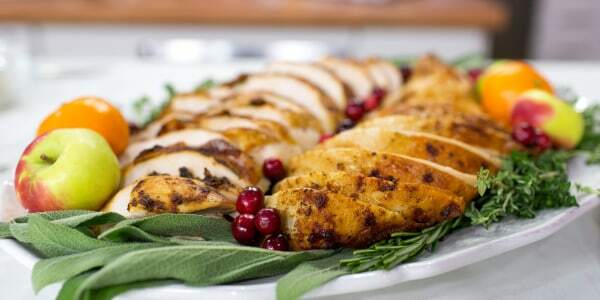 The main thing is to not make guests feel that they are obligated to cook when they're coming over for the holiday. 2. If guests want to contribute, play to their strengths. “The first year we tried hosting Friendsgiving, we tried to just let things flow and ended up with a turkey, 10 pies and a case of beer,” Elizabeth Blau, a Las Vegas-based restaurateur, told TODAY Food. Blau now has a solid Friendsgiving game plan in place. The wine is taken care of by her friends who like to drink, but don’t cook. Desserts are handled by her friends who don’t cook or drink. She takes care of almost everything else. Also, it's OK to ask friends to bring non-food items, like Tupperware for leftovers or chairs for seating. When assigning items, play to people's strengths. For example, don't assign an appetizer or salad to a friend who has a tendency to arrive late to events. April Masini, the etiquette expert behind Ask April, thinks that the assigned items are good conversation starters for the feast. “If you’ve got friends from different sectors of your life invited and they don’t know each other, they have their food assignments to talk about," she told TODAY Food. 3. Encourage and honor unique traditions. Amanda Freitag, star of Food Network's "Chopped" and host of "American Diner Revival" doesn't even cook a turkey. "Relax and make your favorite protein," the featured celebrity chef for a new Friendsgiving store in Franklin, Tennessee, told TODAY Food. "Your guests are your friends. It's a no judgement zone that day." Celebrity chef Curtis Stone agrees that a turkey doesn't make a Thanksgiving. "America is such a melting pot and wonderful mixture of cultures, quite similarly to [Australian]," Stone told TODAY Food. "Clearly, we don’t celebrate Thanksgiving or Friendsgiving in Australia, but it’s become one of my favorite holidays since moving here." Stone told TODAY Food that he encourages guests to bring dishes or family recipes that celebrate their heritage. "It may not be a traditional holiday menu, but it’s a great way to learn more about the people in your life and their personal stories," he said. Since he’s Filipino-American, restaurateur Billy Dec once served his friends a turkey stuffed with papaya, longaniza sausage and Hawaiian bread. “It honored tradition, but it was our own version that everyone LOVED and it gave my family an amazing opportunity to tell stories about the ingredients to guests who were not familiar with our heritage,” Dec told TODAY Food. 4. Keep everyone in the loop. After asking about food allergies and requirements, make sure everyone knows exactly what to bring and how many people it should serve. Alfredo Nogueira, chef at Cane & Table (which was nominated for a James Beard Award) in New Orleans, has had Friendsgiving celebrations with nearly 40 guests, so he's a true expert on the meal. “We tried different things for keeping the sides organized, so we didn't end up with a million Brussels sprouts,” Nogueira told TODAY Food. He found that the easiest way to stay organized was by creating a dedicated Facebook group. That way, everyone could know the plan. Tyler Florence, host of Food Network’s "Bite Club" and Lead Innovator at Innit, uses the Innit app to share recipes with his guests. 5. Discuss kitchen availability and table space in advance. Registered dietician Kristin Koskinen grew up in a military family and has had many Friendsgivings. Her top tip is to let guests know what the kitchen is going to look like on Thanksgiving. It's important to be mindful of table space, too. Cat Cora, the first female Iron Chef on "Iron Chef America," told TODAY Food that she tries to keep the table settings as simple as possible, so she has plenty of room for food. After all, besides the friends, that's what Friendsgiving is all about.